Details Dietary Supplement. Pro. Anabolic. 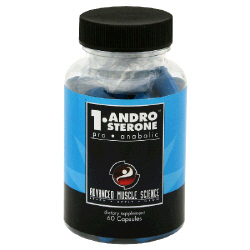 1-Androsterone converts at a high rate to 1-testosterone and will give you better strength and size increases than the old 1-Andro or 1-Test products. These statements have not been evaluated by the Food and Drug Administration. This product is not intended to diagnose, treat, cure, or prevent any disease. Nutrition Facts Serving Size 1 capsule Servings Per Container 60 Amount Per Serving % Daily Value Piperine 2 mg 1-Androstene-3b-ol, 17-one 100 mg Luteolin 3 mg Standardized Forskolin 10 mg *percent Daily Values are based on a 2,000 calorie diet. Ingredients: Other Ingredients: Pyrolsate, Gelatin, Magnesium Stearate, Silica. *These statements have not been evaluated by the Food and Drug Administration. This product is not intended to diagnose, treat, cure or prevent any disease. Directions As a dietary supplement, take 1 to 3 capsules per day in divided doses with food. Use in cycles of 4 to 6 weeks. Do not exceed 3 capsules per day.